How can we tap into our inherent wisdom amidst the noise and distractions of our world? Shamanic Journeying is a simple and powerful tool that has empowered my life and can empower yours. The Shamanic Journey is a direct way to access your inner knowing. With the heartbeat rhythm of the drum, you are able to shift dimensions and enter what Michael Harner calls the Shamanic State of Consciousness, a state of conscious ‘dreaming awake’. The drumming is our path into the spirit world. In this state, you can meet your spirit guides, power animals, and other loving compassionate spirit allies and teachers to receive guidance, wisdom, and healing for yourself and for others. During the Shamanic Guidance and Journeying session, I will familiarize you with the safe and effective techniques that are the basis of shamanic journeying. You will be introduced to the traditional shamanic landscape of the Lower, Upper and Middle Worlds and while I drum you will travel to one of these worlds to encounter your helping spirits and receive the insights you seek. Following your journey, it is important to integrate the wisdom and guidance you received. For example, during your journey, you may have encountered an animal that you want to know more about, you may have been given a particular task to carry out by a helping spirit, or you may have been shown a location or a symbol or artifact that you want to research. This is the practical application of the journey work that can bring healing and enrich your life. Wear comfortable clothing and bring a notebook and pen. Following many years of psychedelic exploration, in the early 1990s I had the privilege of studying with Michael Harner, widely acknowledged to be the world’s foremost authority on shamanism. One of the pioneering legends of anthropology, shamanism and ayahuasca research, Dr. Harner (1929 – 2018) left an extraordinary academic and shamanic legacy to the world, bringing the tradition and its richness to Western awareness. He founded the Foundation for Shamanic Studies and his 1980 book The Way of the Shaman: a Guide to Power and Healing was pivotal as a reference for all those interested in cross-cultural and current forms of shamanism. From this beginning my training has been further developed through the work of Great Mystery, with both traditional and contemporary shamanic practitioners and medicine men and women from across the Americas, Polynesia and Siberia. What is shamanism and why is it important now? At its heart, shamanism is about getting back to our true nature as human beings. Around the world today there is a growing interest in shamanism. A spiritual ecology, it is highly relevant at this time of environmental crisis as it offers something lacking in the anthropocentric worldview: a reverence for all Life and a spirit based means of communication. In shamanic cultures, all things are seen to be interrelated and interdependent and everything that exists is alive, not only the animals and plants but also the wind and the rocks and the rivers. Not a religion but a methodology, shamanic practice provides a way for connecting directly to the highest sources without the need for intermediaries such as religious authorities. It is a means to obtain knowledge based on the premise that we are not limited to working in one reality or one dimension when we need assistance. Alongside the world with which we are familiar, there is a completely different reality, a reality full of beauty and harmony populated by spirit guides, power animals, guardians and other compassionate helpers that can assist us in creating fulfilling and meaningful lives. Estimated to be at least 100,000 years old, shamanic journeying was used by ancient cultures to interact with these compassionate spirit helpers for purposes such as locating herds for hunting and for healing (the lives of the members of the tribe quite literally depended on the shaman’s ability to access precise information from these other realms). Today we may wish to find answers to questions such as, are we in the right relationship? where should we move to? or what is the best way to help our family or our community? How can we know if we receive accurate information? By testing it in ordinary reality. And the more we practice the more we learn to trust this ancient and natural connection. 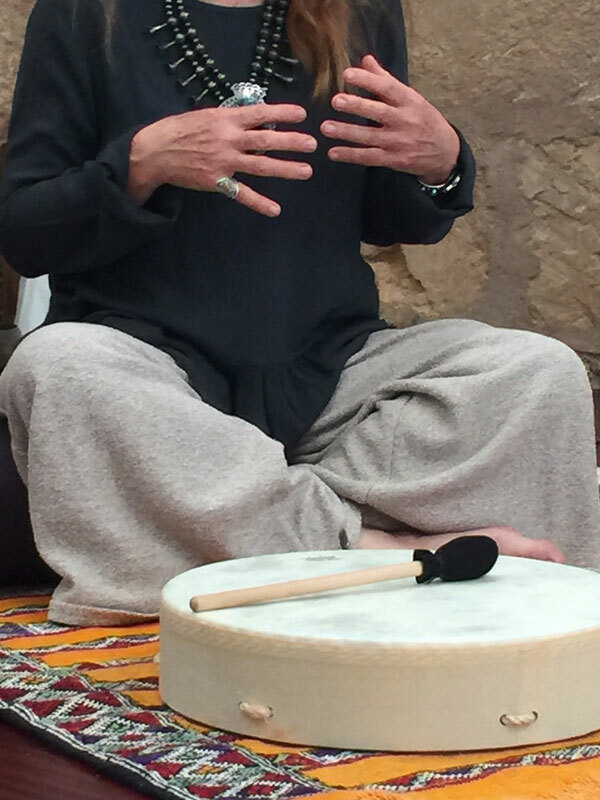 Just like in tribal cultures, contemporary shamanic practitioners typically utilize rhythmic drumming or other types of percussion sound to enter an altered state of consciousness. This traditional drug-free method is completely safe. During a journey, if practitioners do not maintain focus, they simply return to their ordinary state of consciousness.